Do you have one of those children that subsist on only one type of food? A picky kid gets their first taste of macaroni and cheese and until they take off for college their fate is sealed. There are a lot of kids that have that tendency, in fact, a whole species has a hankering for nothing but a low nutrient, slow growing plant, bamboo. In fact, these guys are so devoted to eating a ninety-nine percent bamboo diet that they devote about twelve hours a day to eating. To continue to survive these adorable black and white bears have to eat about one hundred pounds a day. Imagine if your macaroni kid sat down to a trough of one hundred pounds of Kraft every day, that's some pretty intense competitive eating. One day of that and they could be free of their cheesy noodle obsession for life. Pandas need to be intense about snacking, from infancy to the time they're full grown they grow from the size of a chubby pencil to up to a two hundred seventy-six pound giant panda. It's a lot of work to grow that fast but you don't have to provide your kid with a trough of noodles to grow into a full grown panda, just provide your child with this inflatable suit. 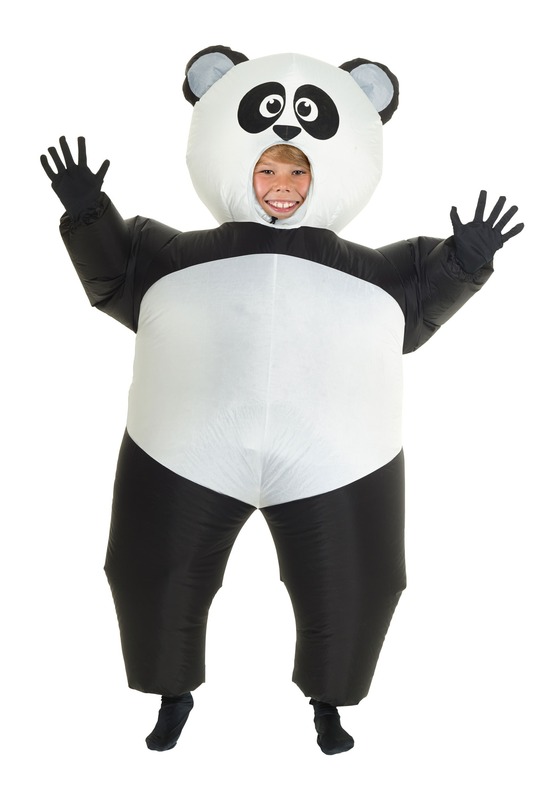 Your panda kid will have a blast while being able to see and breathe with ease. All your child needs to do is step into the costume, put on the hood and pull the drawstring, and turn on the fan and they'll fit right in China's forests. So, tell your kiddo to put down that bowl of bamboo, turning into a panda is easier than ever!